Good morning, welcome to another episode of #ThatBusinessShow! Airing every weekday at 8am, #ThatBusinessShow is a positive show with positive message: Supporting our local community by inviting professionals who change our community for the better to come on the #MorningAir to spread their positive message and promote what they do! Coming on the show today was Real Estate Educator, Expert, and Investor, Larry Harbolt! Next on the show, promoting a healthy way of living through the food you eat, Stevie Morgan, CEO of CaterMeFit! Our two guests go hand in hand in a way, one helping your business life, and the other helping your personal life! Please be sure to head to http://www.tampabayradio.com if you missed the show on the #MorningAir! If you like video more than audio, then head to Jamie’s YouTube Channel at http://www.youtube.com/jamiemeloni! Starting off the show with more of a business flavor, Jamie Meloni welcomed Larry Harbolt onto #ThatBusinessShow earlier this morning! Larry is the nation’s leading creative Seller Financing expert as well as a popular national real estate speaker and teacher whose time-tested strategies and “nuts and bolts” teaching style has helped thousands of aspiring real estate entrepreneurs realize their financial dreams with little or no money and without the need for credit. Appearing on numerous outlets such as radio and television, Larry’s creativity with buying and selling real estate is very well known. He spoke to our listeners about the beginning of his Real Estate roots, coming from blue collar pipe worker to elite property investor! He is one of only two real estate teachers whose works have ever been inducted into the Library of Congress. Not too bad coming from a Midwest Pipe Worker! That’s what #ThatBusinessShow is all about, celebrating the entrepreneurial spirit of individuals who refused to go the regular path! If you want to learn more about Larry Harbolt’s educational offers and success, then head to ww.larryharbolt.com! 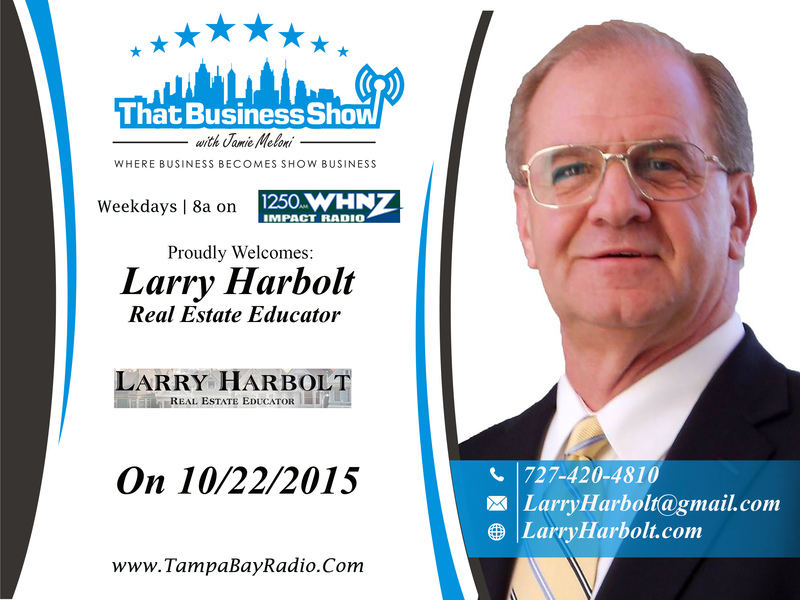 If you missed the show and want to catch Larry Harbolt on #ThatBusinessShow, then head to http://www.tampabayradio.com! 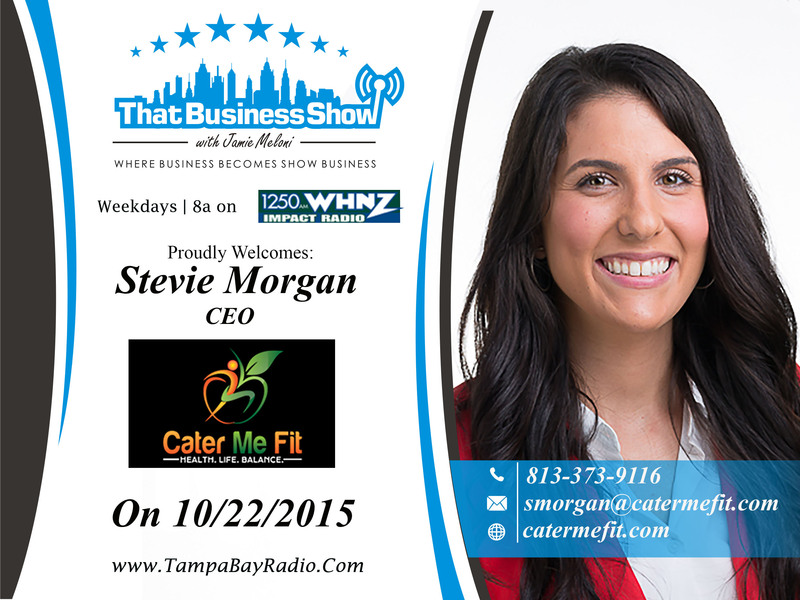 Coming on next on #ThatBusinessShow, promoting a healthy lifestyle was Stevie Morgan, CEO of CaterMeFit! CaterMeFit Inc is a trusted wellness corporation and fresh food meals delivery service dedicated to providing the highest quality, fresh and nutritious gourmet food to busy professionals, stay at home moms, athletes and anyone looking to obtain or maintain a healthy lifestyle. With their meals being prepared locally with local and seasonal ingredients, CaterMeFit is dedicated to great food to keep you looking your best! The mission of CaterMeFit to promote a healthy lifestyle through perfectly proportioned and deliciously prepared meals. They provide quality and excellence through customer service, qualified health conscious staff, quality local and seasonal ingredients and a creative approach to food. On the show, Stevie spoke to us about the many intricacies of her business, how she delivers all the way to Pinellas, prepares food fresh, and delivers it straight to your door! Offering many different different diets from Pescetarian, Vegetarian, Traditional foods with portions in mind, to the Paleo Diet! To find out all about CaterMeFit, and see all of their meal options custom to you, head to http://www.catermefit.com! This entry was posted in Articles, Entrepreneurship and Business and tagged business, food, health and wellness, interview, radio, show business, talk. Bookmark the permalink.